Sarah Harris, a widowed New York City tow truck driver, is tired of her life and the negative elements in it. She is treated like a doormat by her son and her mother’s constant berating of her makes her feel like a child again. Sarah’s boss resents her desire to better herself and does everything he can to throw obstacles in her way. At forty-three, Sarah decides to return to college, applying to a nontraditional Scholar’s Program headed by Dr. Winnie Thompson, a woman who is also in need of a life change due to a particularly unsatisfying love affair with her boss at the local university. 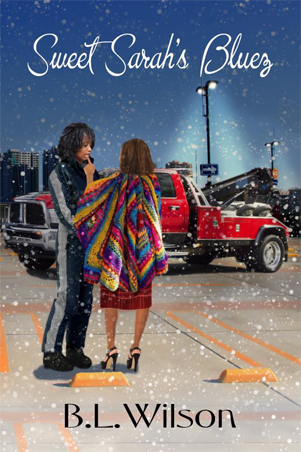 Both at a crossroad, Sarah and Winnie meet one chilly night when Winnie is stranded by a blown out tire on her car. The two women are drawn to each other and seek support from one another, even though Sarah knows that her family and friends may object to the discovery of her sexual orientation as a lesbian. Will Sarah overcome the barriers to her happiness, or will she continue to suffer from Sweet Sarah’s Bluez? Sweet Sarah’s Bluez, is available for order 1/2/17 on Kindle.